Bxc3+ varies from my previous play. "If 8.bxc3 then 8...0-0", has been proposed. PGN of all the CZE-USA games. 3rd round games from the Ellner Memorial have been uploaded in java-replay and zipped PGN. Thanks to all for playing and to Geoff McAuliffe for directing. The next USCF-rated event at the Kenilworth CC will be G/60 Quads, which will run from 5/12-5/26. Mark Kernighan defeated Ken Chieu in a time scramble to win the Irving Ellner Memorial Swiss for the 4th straight year. Chieu, Ian Mangion and I shared 2nd-4th places. There was a 4-way tie for U1600 honors. All 8 players in the event won a prize!! The complete set of 3rd round games will follow. Anna Zatonskih has won the U.S. Women's Championship, after playing a Kenilworth Summer Tourney-like 19 games. Ken Chieu, Mark Kernighan (who beat my Bogo-Indian) and Pat Mazzillo won. Lou Sturniolo took a half-point bye. Joe Renna received a full-point bye. PGN of all the games, the furthest advanced of which are already at move 21. Sturniolo took a 1/2 point bye. Renna gets a 1 point bye. I have uploaded 2 of my recent wins against the Slav Defense. 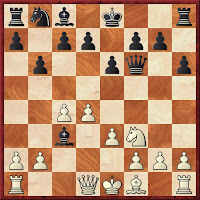 Yesterday's interesting, French-like, English turned Winawer Counter-Gambit over expert Rooney Simonaitis. 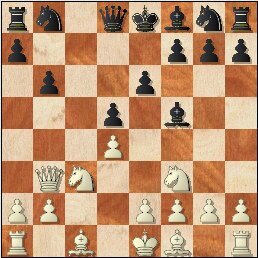 Three annotated games from Thursday's opening round, including the Sturniolo-Kernighan draw and my W over Joe Renna's Gruenfeld, have been uploaded in java-replay and PGN. 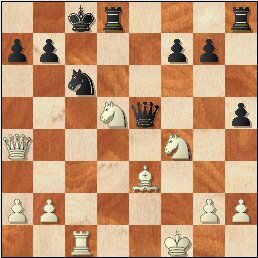 I had this position against Bert Shiffman in 2002 & 2004. There have been no moves in my other game since April 9th. NM Ken Chieu, Ian Mangion and I lead after 1 round of the KCC's Irving Ellner Memorial Swiss. Lou Sturniolo, coming off a draw against IM Dean Ippolito, nicked NM Mark Kernighan for a half-point. Late-entries will be accepted until the start of round 2, provided it leaves with an even number of players. Fill-ins may also be permitted. Games and 2nd round pairings will follow. 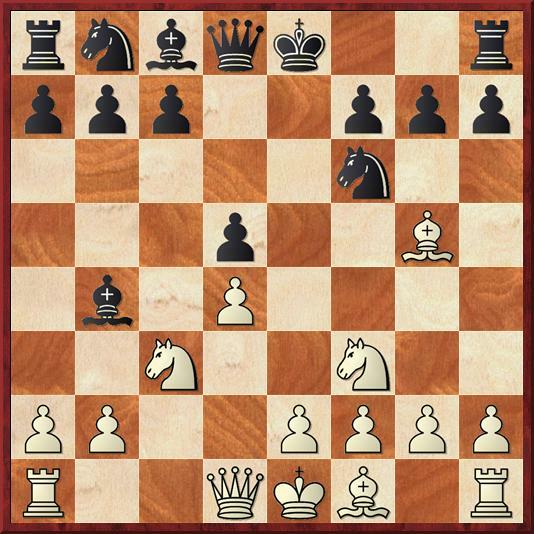 Members of the Kenilworth Chess Club scored +1-1=5 at IM Dean Ippolito's April 9th simul. There were 91 official entrants. Some opponents, such as family members, did not count for World Record purposes. I think at least 25 players were class A or above. Four were masters. 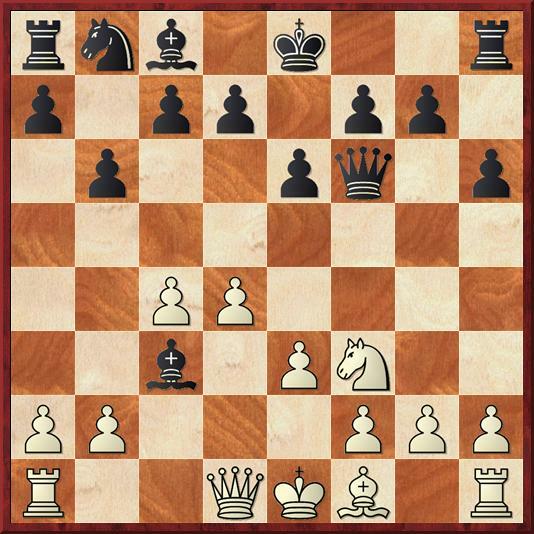 Despite problems with the Kenilworth contingent (detailed below), Dean beat his share of high rated opponents and had a pretty tactical win over Matthew O’Brien, who is rated about 2130. In the end, he had 67 wins, 4 losses, and 20 draws. That is an 84.6% winning percentage. The fearsome Kenilworth contingent included Steve Stoyko, Ken Chieu, Kevin Chen, Ari Minkov, Joe Renna, Max Sherer, and yours truly. Steve handed Ippolito his first simul loss in well over 10 years and 10,000 games and the exhibition was stopped momentarily while the significant victory was announced to the crowd, who responded with rousing applause for both players. Ken, Max, Kevin, Ari, and I drew. Joe Renna lost after a very tough fight, his game going about 9 hours. So Kenilworth's 7 players (7.7% of the official participants) hit .500 (25% of the IM's losses and draws). while all others batted just .125! Here is Dean's win over Renna, in java-replay and PGN, which I was asked to annotate for the Around About Peterstown newspaper. Every upload to my chesscoroner folder has been checked. There are no viruses, spyware, pop-ups or other crap in them. 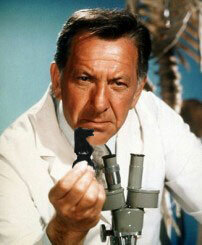 Register : At site on 4/14 from 8:00-8:30 p.m.
A reader has informed me that this blog seems "to be infected with a virus. Every time I visit"... "my anti-virus software gives me a warning. I tried it several times, even just going to the site and leaving (no java replay, no download of pgn) results in an attempted attack." I removed the Geo-Counter and clock from my sidebar, one of which was causing pop-up ads, but he's still getting the alert. You may recall I got similar warnings about the Westfield CC site last year. It's still 1-0 for the Czechs and my foe is still moving at a snail's pace. I hope things pick-up when the clocks start next Saturday on Thursday evening. IMO, the free time is unnecessary and the 50 days for 10 moves control is excessive. 30 for 10 would be more than enough.